I want to preface this review by admitting that I’ve been an avid fan of the Tomb Raider franchise practically since its inception in 1996. From the very outset, developer Eidos’ introduction of Lara Croft’s world-traversing treasure hunting escapades has received critical acclaim and was arguably the proverbial spark that lit the action-adventure genre which permeates the medium today. Before we get started on Shadow of the Tomb Raider, a brief history lesson on the decades-spanning franchise that has managed to evolve and adapt through the changing tastes of gamers (impressive as we are a truly fickle bunch). First developed by Eidos Interactive in 1996, Tomb Raider follows the globe-trotting adventures of British archaeologist and explorer Lara Croft. A little-known factoid about the early conceptual period of Tomb Raider is that the main protagonist was initially planned to be a male – giving it even more of an Indiana Jones feel than it admittedly already has. Ultimately, the aforementioned resemblance wound up being one of the reasons for the change of plans, as the character would not have been able to live up to such an iconic film hero. The other reason, based on test groups from the developer and simple research into the gaming community, was that having a badass female adventurer would be able to appeal to both male gamers, who made up the lion’s share of the community, as well as female ones who could relate on a physical level with a female hero. Lara Croft was a character who girls wanted to be, and guys wanted to be with. The series received several entries across the PC, original Sony PlayStation, and Sega Dreamcast platforms, and each one proposed new challenges for Lara Croft to overcome. Her biggest problem, however, came in the form of adapting with the times. Nostalgia gaming is on the rise now; however, there comes a point within every gaming generation wherein a certain archetype of the game no longer appeals to the general audience and subsequently becomes relegated to a small, niche group that hails the days of yore as being superior to today’s works. That’s all fine and good from an artistic perspective, but from a money-making and running-a-successful-business point of view, it doesn’t quite work as well. Successful businesses know how to appeal and play to the majority and are always attempting to grow their audience and paying customer base. The first time that Tomb Raider truly struggled, both critically and financially, was the PC, Mac OS, and PlayStation 2 release of Tomb Raider: Angel of Darkness. The developers attempted to add an edginess and measurably darker tone to the game both visually and from a narrative angle, and that attempt not working was one of a number of issues that plagued the first entry in that era’s newest generation of the franchise. In addition to the undesired dark tone, the game also suffered from no shortage of mechanical difficulties, with a multitude of areas in the game having glitches and mechanics of varying quality. Following this near-catastrophe of a game, development was handed off to Crystal Dynamics, who produced the critically successful trilogy of Tomb Raider: Legend, Tomb Raider: Anniversary, and Tomb Raider: Underworld. Crystal Dynamics was praised for bringing the franchise back to form with these entries, and for their part, they also sold reasonably well. But the once tried-and-true Tomb Raider game-play mechanics were beginning to date themselves, and while Crystal Dynamics’ trilogy was quite possibly the best representation of classic Tomb Raider game-play, that same game-play was no longer necessarily what gamers were flocking towards. 2013 was the year that changed everything. Developer Crystal Dynamics had become aware of the iconic franchise’s aging game-play and took the time between 2008, when Tomb Raider: Underworld had released, and 2013 to figure out what they felt was the right formula to bring the series into the modern age – and that is precisely what they did, both in effort and in result. Their reboot of the long-adored series, aptly titled Tomb Raider, re-imagined Lara Croft as a young grad student, grounding her more in reality. They also added more action and traversal elements to the game and eliminated the now considered clunky puzzle and movement mechanics that, unfortunately, dated the franchise. Many gamers who were critical of the reboot, while not necessarily being longtime Croft fans themselves, touted the 2013 reboot to be little more than an Uncharted knock-off. While it is more than fair to say that Crystal Dynamics took many nods from Naughty Dog’s award-winning series of a similar theme, they put their own spin on the popular cinematic action game-play that made Nathan Drake famous. Tomb Raider lacked the puzzles and the series’ infamous tombs, but apart from that, it managed to stand out alongside such 2013 releases as Bioshock Infinite and aforementioned developer Naughty Dog’s The Last of Us – no small accolade. The 2015 follow-up, Rise of the Tomb Raider, managed to improve upon everything that made the first entry in the origin reboot great and made it even better. With that adventure of a prologue out of the way, I’d like to state that Shadow of the Tomb Raider shows that Crystal Dynamics took everything that they learned, both in development and from the fans, with the prior two reboot entries and improved upon what was already great while addressing the fans’ concerns. From the get-go, Shadow of the Tomb Raider harkens back to the opening scene of the 2013 reboot, with a deadly plane crash over South America. The cinematography utilized in this sequence brings to mind some of the best in film, and my heart was left racing right from the start, well before I ever gained control of the intrepid adventurer. We soon find out that we are going to begin a bit before the plane crash with Lara and Jonah, her traveling companion since the first entry in the trilogy, in Cozumel, Mexico following reboot series antagonist organization Trinity as they seek out a relic from Mayan culture. Lara soon finds out that the act of removing the relic, an ancient and ornate dagger, sets off massive tremors throughout the underground pyramid they’re currently in, threatening to bury the archaeological pair underneath tons of rock and stone. Upon escaping the collapse, Lara is confronted by an archaeologist and leader of Trinity’s Cozumel cell, Dr. Pedro Dominguez, who quickly informs the Tomb Raider that with her removal of the Mayan dagger, she has set off events of the Mayan apocalypse. 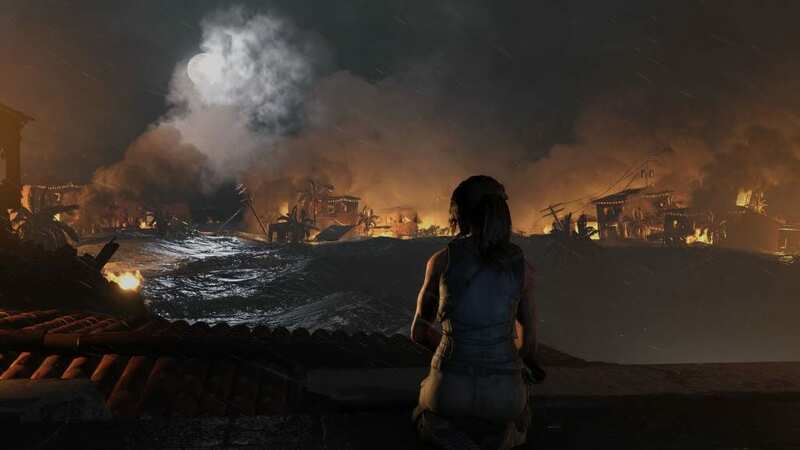 Briefly, Croft scoffs at Dominguez in disbelief at the superstitious accusation, before one of the foretold apocalyptic events, a massive hurricane, causes a destructive flood that wipes the nearby village and many of its people off of the map and leaves Lara to ponder the consequences of her actions. Lara began her journey in 2013 as a survivor, hunted by radical cultists on the island of Yamatai. Her journey to Kitezh in the sequel showed her as a more skilled and determined adventurer. Her Mezoamerican exploration in this latest release shows her to now be a hardened adventurer who has a focused goal of tracking down Trinity and stopping their plans, wherever and whatever they may be. Crystal Dynamics has shown great skill in maturing Lara Croft as a character by giving her real emotions and real struggles, and Lara’s challenge of dealing with the resulting consequences of her actions, and the dichotomy of that with her desire to destroy Trinity and willingness to do so at all costs. 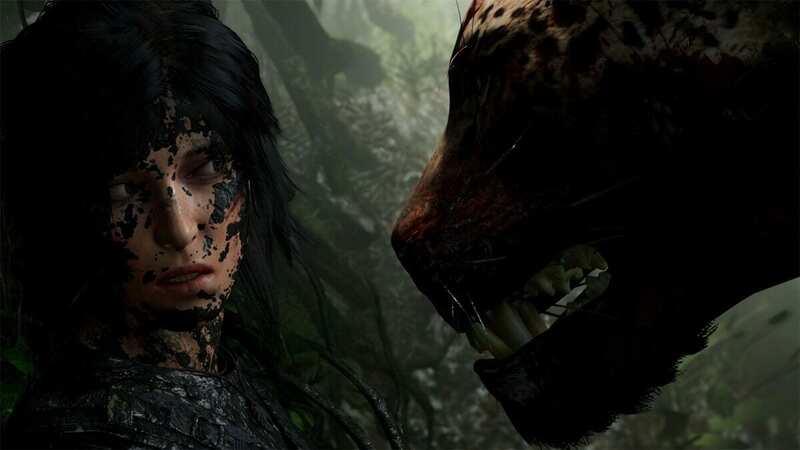 Lara has become a tempered weapon, both mentally and physically, in Shadow of the Tomb Raider, and there is a measurable growth to her character from the previous two entries. The credit for this all goes to the writing and animation teams, and most notably Camilla Luddington’s spot-on voice acting work. Lara Croft has had a number of designs and great voice actors portray her over her two decades, each bringing something different to the character based on how she was written at the time. Luddington’s delivery of the lines, especially in the truly emotionally driven moments, is a perfect sale and brings a level of grounded authenticity and sincerity to Lara Croft that exemplifies the gravity of the trilogy’s narrative (which has never been truer than in Shadow of the Tomb Raider). Further maturation for Ms. Croft comes in the form of how she employs the culmination of the guerrilla warfare tactics that were honed over the last two outings against the forces of Trinity and the other deadly jungle inhabitants. Lara’s one-woman war is a truly brutal one, with her utilizing everything at her disposal, from towering cliffs and other environmental features to her trusty climbing pick-axes and bowstring, to take down her prey. Early on, you face a deadly South American jaguar in what begins as a terrifying scene of the jungle cat attempting to make a meal out of you. After getting the fearsome feline off of you, you must pivot between dodging the beast, firing off arrows in the moments when you aren’t getting leaped at or pinned down, and fending it off in a mini quick time event when you do get pinned. Depending which difficulty level you choose, this fight can range fairly widely in its length, but not in its intensity, as it is quite the scene to get through and brought me back to the early fight against the bear in Rise of the Tomb Raider. More broadly, combat as a whole has been further refined from the previous game, and the mechanics for each of the game’s many weapons feels responsive, and there a lot of them: there are seven bows, seven pistols, six rifles, and four shotguns, each with their own parameters in combat. I never found myself fumbling with aiming, even on max sensitivity settings, something that I cannot claim for myself with most other shooters. The result of these finely-tuned controls gives you more control over the difficulty of Shadow of the Tomb Raider, as you are then free to base your level of success more on your skill with taking down more damaging enemies as opposed to magically skirting shoddy controls in combat. On the topic of difficulty level, the game allows for hitherto unseen tailoring for players to customize their adventure with. Within the first three of four difficulty levels, you can further tailor the level of challenge for Combat, Exploration, and Puzzles. This heightened customization can be an excellent aid for players who want a challenge in, say, combat, but would rather breeze through the game’s puzzle sections, preferring the action to the slower parts. Lara has new options when hunting and crafting now as well. In addition to making arrows and healing salves, she can now use various plants to craft perception boosting or damage-reducing ones, or even ones that increase her focus to the point of slowing down time when aiming. Exploring takes on a brief new form when (without any spoilers) the story brings us a flashback to a very young Lara playing around her family’s manor. The mission was, as stated, brief but quite enjoyable to see such a playful and wistfully innocent Lara before the tragedies of her life befell her. I wish that this portion had been longer and that it had been utilized more, but that not being the case doesn’t take away from the story; rather it would have fleshed out more of Lara’s childhood and backstory, and been an interesting facet to the overall narrative. Speaking of the narrative, Crystal Dynamics have proven themselves a rock star team where telling emotional stories with Lara Croft, and Shadow of the Tomb Raider is the culmination of everything that has made this trilogy great so far. This game is a roller coaster ride, with all of the emotional peaks and valleys that one would expect to go along with such a comparison. Few games have elicited a genuine emotional response from me, the last entry being one of them, and this game managed to do it again. The story is given a gravity, both of the emotional and apocalyptic variety, in which many games today are lacking, and the performance of Dr. Dominguez adds to that with aplomb. In typical Tomb Raider fashion, the game’s world opens up into a connected world of sandbox areas for you to return to and explore further than you were able to on your first visit. Doing so allows you to complete any exotic hunts, Challenge Tombs, Challenges, collect missing Relics, etc. that you may have missed initially. Doing so extends the already sizable length of Shadow of the Tomb Raider by no small margin, and it has given me hours of exploration and enjoyment. If I had any real gripe with Crystal Dynamics, it would be one that has no actual impact on either the story or the game-play, but rather more of a treat of fan service (no, not that kind) for longtime Tomb Raider faithful. I was thrilled when the developer released the classic Lara skins in Rise of the Tomb Raider and while it’s great that they ported those same skins over to this game, the fan in me can’t help but wish they had done more. Instead of a polygonal Lara running around Paititi, I would have much rather had fully rebuilt, from the ground up, renditions of Lara Croft from days gone by, much in the same way that the recent Crash Bandicoot Insane Trilogy and Spyro Reignited Trilogy remakes have done with their own respective retro franchise. The sounds of the jungle are beautiful, I would highly encourage playing this game with a high-end gaming headset or surround sound system if you are able, and I can’t help but feel like a cross between Rambo and Indiana Jones as I hunt my way through the game’s various environments. Speaking of which, the heavier focus on underwater travel is something of which I was initially leery, but my trepidations were soon quelled, and the swimming mechanics feel streamlined for a liquid-smooth experience. Many franchises today have fallen into sequel syndrome, where the publishers see a cash cow and decide to make it an annual one. Crystal Dynamics clearly has shown they not only know what they’re doing where quality is concerned, but also that they have a deep love for the fans and the spirit of Lara Croft, even changing her default outfit to be a modern take on the old 1996 gear. They’ve successfully captured the genuinely pivotal moment when she becomes the adventuring heroine that gamers the world over have come to know as the Tomb Raider. I cannot help but recommend Shadow of the Tomb Raider to anyone who is either a fan of the franchise, fell in love with the reboot trilogy, or just loves a fantastic action game that offers a compelling narrative, real human characters, and engaging and fun game-play. Crystal Dynamics definitely has been cooking up a recipe for success. Crystal Dynamics' attention to detail, both in improving what they've already built upon before and in their listening to the fans, has hit paydirt. Lara Croft's transformation into the Tomb Raider has been well worth the wait, and I hope to see more in the future after this truly fantastic game for anyone who loves action, and a treasure for her fans.